Can a Felon Have Power of Attorney? For those who have had a family member need someone to make decisions for them, or who required that for themselves during their legal struggles, a power of attorney may have been sought. In each case, someone was appointed to have power of attorney for the other person. 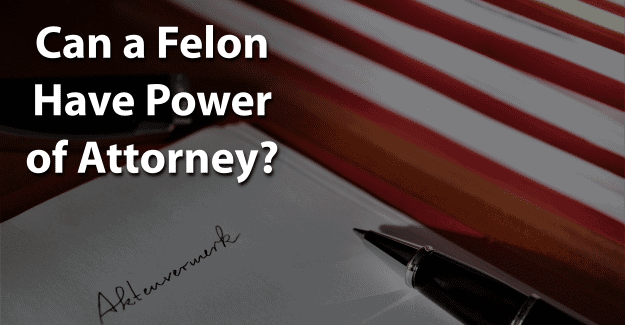 This blog post will address the question of whether or not a felon can have power of attorney. A power of attorney is a legally-binding document giving one or more persons the power to act on someone else’s behalf. The person who signs away the power of attorney is called the principal. The power of attorney gives legal authority to another person, called an agent, to make property, financial, and other legal decisions on another person’s behalf. A power of attorney is designed to grant either specific or general rights to an agent and duplicate some or all of the principal’s rights. There are several kinds of power of attorney. The first is the durable power of attorney that allows an agent to make any legal decision for him or her. A durable power of attorney remains in effect until it is revoked or until the principal dies. A non-durable, or special power of attorney, grants the agent power for a specific purpose or a period of time. This is often used for a specific transaction, like the sale of a house, while someone is unable to be present. A springing power of attorney becomes effective at a future time when a specific event happens, such as illness or disability. There are no qualifications for a power of attorney other than being selected by the principal, and agreeing to act for that purpose. Criminal records and legal training are not considered as to whether someone is qualified to act as an agent. For those with power of attorney, certain features are important. He or she must be honest, cautious with any financial decisions, and willing to put in the time it takes. It is important to be able to communicate with the principal and any lawyers who are involved. In cases where the agent is dishonest, that person is legally liable to the principal for any losses sustained, such as through theft. The principal has the right to ask the court to demand an account of the agent’s actions. The agent can be asked to provide a list of all steps taken and may have to include receipts for any expenses. A power of attorney may be terminated in many ways. The most common method is the principal terminating the agent’s powers. A power of attorney may also terminate automatically if the principal either dies or is mentally incapacitated. The agent can be removed, and the principal has the right to sue the agent for any losses sustained. The agent can be required to pay a fine or serve a sentence for theft. There are no laws preventing a felon from having power of attorney. A felon is able to serve as the executor of a will, which is a function like power of attorney. Now that they have been released from prison and have committed to living an honest life, even questions about their honesty can jeopardize their future and result in returning to prison. It is important to be honest in having power of attorney. If a felony isn’t disclosed but is found on a background check, this constitutes fraud and is punishable. It is a crime to falsify any information, which could result in being sent back to prison. In order to be successful in getting power of attorney, it is essential for felons to be honest about their background. They are already viewed with negative perceptions of being dishonest, untrustworthy, and unwilling or unable to follow directions from authority figures. Having their record expunged can give them the chance needed to begin with a clean record and succeed in getting power of attorney. Expunging a criminal record allows anyone to honestly state that he or she has not been convicted of a crime. It is challenging, but it might be worth it for a felon wanting to get power of attorney. Giving him or herself the best chance for success by having his or her record expunged and being persistent could make a critical difference. What do you think about this blog post? Have you or someone you know been in the situation of trying to get power of attorney with a felony? What was that like for him or her, and how did he or she achieve success? Please tell us in the comments below.